On 25 June 2013, Emir Hamad bin Khalifa Al Thani announced that he would hand over power to his son and Crown Prince Tamim bin Hamad Al Thani. At first glance, this unusual step came unexpectedly, as the Emir, at 61, was at the height of power. In a region where leaders usually stay in power until they either die or are ousted, Hamad arranged a smooth succession of power to Tamim, saying that ‘the time had come for a new generation to step forward to take responsibility’. It made Tamim, 33, the youngest ruler in the Arab world. Hamad transformed Qatar from a quiet, unknown country, to a powerful and controversial regional player, mediating in regional conflicts and supporting (radical) opposition in Syria, and Islamists in Tunisia and Egypt. Qatar managed to remain politically stable, while intervening in the uprisings elsewhere. In 2012, it won the right to host the FIFA World Cup in 2022, sparking a huge infrastructure boom to facilitate the event. Yet, the freedom (through al-Jazeera) and support for change that Qatar has promoted in the region, have not been advanced in Qatar itself. Al-Jazeera has been criticized for being strongly guided by Qatar’s political agenda while covering uprisings in the region. Journalists are subject to prosecution for criticizing the government. Qatari authorities in November 2011 jailed a Qatari poet for trying to overthrow the government and for criticizing royal family members. Furthermore, the government has been criticized for the lack of transparency in public affairs and monopolization of the decision-making process. The succession of power from Hamad to Tamim does not signal any significant change, other than a transition to a new generation. Nor is it a surprise that Hamad chose Tamin as his successor. Tamim, the second son Hamad and his second wife Sheikha Moza bint Nasser al-Misnad, had in recent years been groomed to lead the country. Tamim was appointed Heir Apparent in August 2003. A graduate of Royal Military Academy Sandhurst, UK, he was Commander of the Qatari Armed Forces, chairman of the Supreme Education Council and Vice-President of the Supreme Council for Economic Affairs and Investment. As the chairman of the Olympic Committee, he supervised Qatar’s unsuccessful bid for the 2020 Olympics. However, Tamim played an important role in the successful bid for the 2022 FIFA World Cup. He had also taken responsibilities in domestic affairs (aanouncing a 120 percent rise of public sector wages in September 2011). He also supported Sheikha Moza’s efforts to change Qatar’s society and culture by promoting (Western) higher education. In this sense, the step is far from revolutionary. Qatar remains autocratic and led by the same family and institutions. The last action Emir Hamad took before handing over power, was to prolong the term of the appointed advisory council to 2016, again postponing elections (earlier promised to be held in 2013). In his first speech, Emir Tamim indicated that he would continue his father’s ‘reform’ agenda and growth projects. While his speech focused on domestic policy, Tamim did not mention anything about Qatar’s policies regarding Syria, Egypt and Libya. Emir Tamim replaced the long-serving Prime Minister Hamad bin Jassim Al Thani with Abdullah bin Nasser bin Khalifa (who is also Interior Minister). Khalid al-Attiyah was appointed Foreign Minister. Jassim, as former Foreign Minister, was viewed as the architect of Qatar’s active and controversial foreign policy. 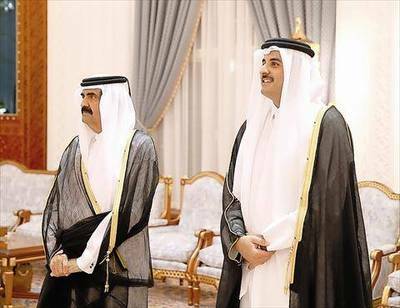 Some analysts argue that Hamad handed over power to Tamim to ensure Hamad bin Jassim would not hand over power to one of his sons. Opposition to Hamad and Tamim mainly comes from Jassim, who is also seen as a rival to Tamim’s mother Sheikha Moza. She developed a high profile, leading the Qatar Foundation.